Along with millions around the world, I, too, wept in shock to see the images of the magnificent Notre Dame de Paris Cathedral burn. It is illogical to think that these things will last forever but, let’s face it, she has been standing for 800 years. We have gotten used to her existence. I could not help but think how, if I had sold my house six months ago, I would be there right now, today, April 16. I had put my deposit on Cook in France, the newest destination cooking getaway created by Linda and George Meyers of Cook in Tuscany, a year ago, thinking my house would be sold and settled, and, even if I hadn’t moved yet, I’d be free to roam Burgundy and Paris for three weeks. Notre Dame would definitely have been on my itinerary. And now I’ll never see her in all her glory. Even though she is badly wounded and not completely destroyed, any restoration that will take place will take years. I don’t doubt it will happen. I just don’t know if I will ever see any of it. This does sound woe-is-me-ish, doesn’t it? I don’t suppose I am alone in this one. Oh, there are those who have no desire to travel and see the world and that’s okay. I’m just not one of them. This thought, of course, begat more thoughts and I found myself remembering those times where the fates were against me (protected me?) such as the time we left late to go to the movies, and as a result were behind an overpass crashing down as I once wrote about here. Had we left earlier… who knows? How some people were supposed to be at the Twin Towers on that fateful day but missed their plane, slept in, whatever; while others, on a whim decided to join up for breakfast as did two sisters, only to have it be their last meal. I could, of course list many a coulda, shoulda woulda or a couldna, wouldna, didna but they will all end up in the same place. This or that did or didn’t happen. Call it fate, call it “not your time”, call it happenstance; doesn’t matter. Whatever works for you to understand the why you missed something or not. I’ve never been a proponent of the “why me?” mentality. The opposite holds true, as a matter of fact. Why the hell NOT me? Why should I deserve or not deserve whatever I am receiving? Which brings me to a show I loved that sadly only lasted two seasons. “Dead Like Me”, with Ellen Muth, Mandy Patinkin and Jasmin Guy, who play grim reapers, working to collect souls: the names and times of death received on post-it notes. It might seem blasphemous to end this serious-starting post with a comedic-drama show but that’s how I roll. This entry was posted in In the news, Writing and tagged Dead Like Me, fate, Notre Dame Cathedral. Bookmark the permalink. I think we all feel bad about Notre Dame. It’s not a woe is me but a definite feeling of loss. As we talked about, I think it’s innate in us humans . . to ask why? As if there exists a definitive answer to the unanswerable questions. And it must feel eerie and sad, the thought that you might have seen the Lady before the devastation. Again, what sounds selfish is really more a matter of wanting to make sense of that which we know, deep down, we cannot. I’ve thought about symbols a lot over the past couple days. What they mean, and how we carry them with us. I struggled for the meaning of symbols for a very long time. Never wanting to believe they might possess the kind of power that sustain us, because in believing such a thing, I felt it mitigated human potential. I was wrong. Symbols provide us with an elemental human need to be a part of something bigger than ourselves. And that’s how I felt, watching news coverage of Paris yesterday with other people- young and old. Just sitting there, watching, together. Even cranky old me appreciated the symbolism in that. Wonderful piece on the human struggle. It is eerie and sad. Since I hadn’t yet planned exactly what I was going to visit, I might have bypassed Paris altogether as I did Rome when I went to Tuscany – saving it for another visit. Again, that why or why not thing. Symbols can me so many things. But yes, I think we desire, deep down, for them to mean something. And, regarding watching the burning of Notre Dame – it united you for a short time, young and old, happy and cranky (😉) proving we are all in this together. Either way, it was a place you wished to visit. And one that had been there for close to a century, so you think . . it’s going to be there. There are real deal symbols and there are bupkis symbols. Unfortunately, we are inundated with the latter. That we are, Miss Q. That we are. Exactly. And it will be but not. C’est la vie. Oh hells yes. Way too many of the latter. Let’s take all those moments of unity and cherish them and work on creating more (not necessarily after a disaster, though). I think it IS up to us, keeping the politics and nonsense local . . and rendering some better ideas for the rest of it. I sound like a hippie. I’ve had an incarnation or several, so okay . . yes. This one fits me just fine. For the love of all things Grace Slick . . ya are one already. Flower Power is a lifetime membership club. I didn’t dare assume, though I really shoulda known better. You know what they say about assuming. It ain’t worth doing unless you’re under the influence of something friendly. Okay, that isn’t what they say. But hey . . why not? I like your version way better. So Imma stick with it, K? It will not do you wrong. I have been feeling kind of like that about people lately. Interesting that you become friends with some people and not others. Leading you to have some experiences, conversations you wouldn’t have had otherwise. Shoulda pursued that person? Shouldn’ta pursued that one … Each decision adds to who we become….? Absolutely, Karen. And good or bad, each esperience/person brings us something. Either we we find joy in the said experience or person or we learn that we should have listened to our gut so next time our spidey senses act up, we react appropriately. Talk about timing for your folks! Oh man. That is awful and crazy. As for me, no, I don’t count myself out. And I did see that most of it was actually saved (a miracle in itself, don’t you think?) Now when it will be open for visit remains to be seen. So happy for you that you did get to see it! Yes indeed! Major miracle that no one was killed. That so much was saved is something amazing as well. I have been in the Notre Dame Cathedral a number of times, it is beautiful indeed. I feel the loss of this historical site. It does make me wonder at all the sources of funds coming forward, but no one seems to care about the homelessness or the hungry children, not meaning to seem unfeeling in this tragic incident. So happy for you that you did see it. And yes, I know what you mean. Someone I admire greatly had a comment that left me a little stunned but it is true. Money comes pouring out for things and yet for people, barely trickles in. That also is one of the (sadder) points I made on ‘Heide’s Blog’ (see my comment further down). I’m glad that other people realise that too and not only the ‘more-in-the-eye’ matters. Oh, I love these musings. And I’m sorry you didn’t get to see it–I didn’t either. That’s such a regret. But you’re right–it’s trust in a Universe that has our backs. Even when it appears painful . . .
And now of course I have to check out that show . . .
You’ll have to watch it online somewhere! I don’t know why it only lasted two season! I’m neither a religious person nor particularly enamored with architecture. But, I’m a big fan of history and culture and these things and places that have survived human drama and trauma for centuries. They represent so much that is our humanity. The loss is a big one. As for “timing is everything” … the summer of 1972, when I was seven years old, my family of six went on a 10 week vacation across America. Crammed into a 21 foot trailer we traveled 10,000 miles and saw a whole bunch of stuff that I have no memory of. But a few weeks after we got back we went to an air show at the Sacramento Executive Airport. When we left, the kids screamed and pleaded for a trip to Farrell’s — an “old-time” ice cream parlor that was the stuff that kids’ dreams are made of. My parents had other ideas. Their plan all along had apparently been that we would have pizza after the air show. No amount of pleading from the peanut gallery got them off their plan — my parents were kind of like that — so off for pizza we went. Farrell’s would wait for another day. If the Paxson kids had gotten their way that day, we would have smack dab in the middle of our ice cream sundaes and what not when the plane plowed into the place. Honestly, neither am I, religious, that is. I do enjoy visiting certain architecture that provide views on history and culture. All is not lost with this one. Wow! That is crazy timing! Of course at seven years of age one would only remember certain things on such a trip like nir getting ice cream when you wanted it. Farrell’s looked like a cool joint. I fully approve of the comedic ending, else you’ll leave us all morose for the day. And tragedy is so often broken by comedy. But I know what you mean about folks who find a reason not to be where they usually are and thereby miss an awful catastrophe. I can think of many instances of accidents avoided by an upset stomach, an alarm clock that didn’t go off, a last minute change of plans. And how many accidents and tragedies that just didn’t happen because everyone who would have been involved had last minute reasons not to be there. Glad you do! All about balance, don’t you think? There are so many instances, for sure and the opposite, too. A couple goes to their favourite restaurant. He sits in “her” place. She laughs and says “Hey! That’s mine!” They switch sides and not not an hour later her side falls. The building crumbles as he watches in horror. Not his time. Much like you, I always see myself as surviving a tragedy and wondering how I will cope with getting past it. I like your happy ending.. Thank you Violet. And so we do. And we move forward and we keep finding reasons to laugh (I do, anyway). The world has suffered a terrible blow this week. Although one thing to celebrate is that no lives were lost. I’m sure I’ve told you that had my NY daughter in law felt better and caught her train on time, she wouldn’t have been late for work at the WTC, 11 Sept. She also wouldn’t be here. That said, I’ll say that you have knack for sharing things in a way we all can relate. Glad you missed the crash 4 years ago. I might not have met you otherwise and that would’ve been a tragedy. It has. In the grand scheme of things, that no lives were lost is amazing. And, truly, there are more important things to worry about. There is much anger now at how money is appearing to fix the church but there are still starving children. I won’t go there. Enough is being said. And yes, you mentioned your DIL’s luck at being ill.
And glad I missed it too! I can understand your “woe-is-me” over not having seen the cathedral, and the fate stories that we all know. As for the comedy at the end–laughing after a disaster is part of the human experience, isn’t it? I remember my sisters telling funny stories at my dad’s memorial service. We’ve all had them at one time or another, I’m sure, those fate stories. Oh I think that’s why i keep being called on to give eulogies. I always try to make ’em laugh so that we celebrate their lives. Oh heck, I swear I only just breathed over my keyboard and my complete comment went awol…. I really must learn to start a ‘word doc’ and then, when done, copy and paste it on the blog I’m commenting on! This is the one time too often that I must restart to write. What I meant to say, Dale, is: GO ANYWAY and VISIT NOTRE DAME! Why do I say that? It’s still a cathedral, it’s still a holy, UNESCO worthy monument, and you can still find a moment’s peace and contemplation. OK, it’s Notre Dame ‘burnt, hurt, sad, damaged, suffering’ etc but the building is still awe-inspiring, maybe even more now then when it was complete in its splendid size and impressive ‘look-at-me’ state! And look how lucky ‘we’ are: The magnificent windows and rosettes have NOT burst, many of the priceless relics were saved and are now well protected, the interior of the huge church has not collapsed, the doors (portals) are still there, and much more. Even the grande orgue is not damaged beyond repair, although the waters certainly have done damage. To think that the roof could have collapsed and fallen on this precious instrument…. What moved me personally most is the following: France being the probably most secular country I know, has shown in many ways that there IS some faith left in its people. Yesterday, I saw hands joining hands with the person next to them, there were people kneeling on the ground, there was singing and openly praying in the streets, folks were standing with their heads bent, candles everywhere (fight fire with fire?! ), groups assembled right there on the point of ‘kilometre zero’ – the centre of France, departure and homecoming point of this country. 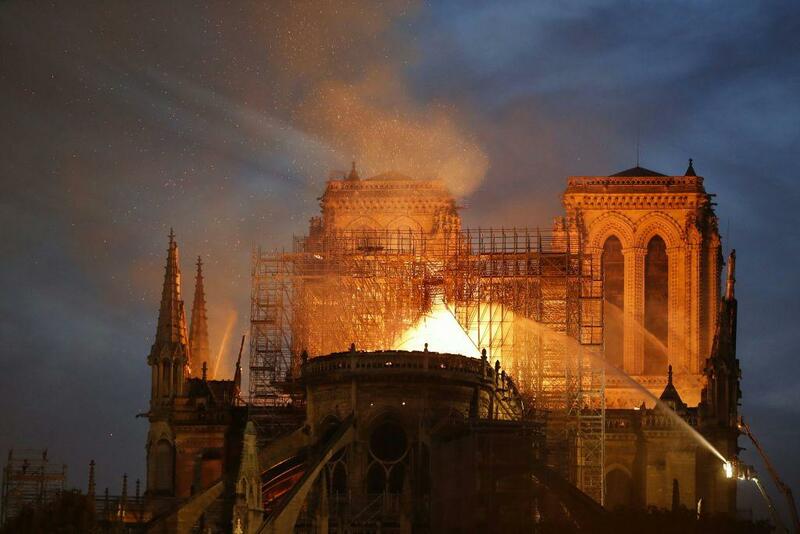 https://heideblog.com/2019/04/16/the-devastation-of-notre-dame-cathedral/ Just move down to Kiki…. In Switzerland (and Germany of course), we have the word ZUFALL (hazard, chance, happenstance) and one of my best liked description is that nothing ever is hazardous, but it ‘falls to us’ (zu fallen). You would say, everything happens for a reason, but I don’t like this saying; it’s too simple. I rather like to think that it’s our way of interpretation of a happening. What’s your idea? Dead like me: I am seriously scared after watching this trailer. How can anybody watch a series with all these deaths?! I’m a defender of funny, heart-warming films, preferably English ones or then actors with a real personality, who become the person they play…. Oh my dear Kiki. Don’t you fear, I will go and that was not my point. And yes much was saved and no lives were lost and who knows when access will be allowed (it will be a good while, I’m sure). And yes, this was a beautiful image to see the joined hands and signing because that’s what tragedy does. It brings people together. Zufall is a GREAT expression. Dead Like Me was a comedy and not just about death. What absolutely amazes, and delights me, is the speed at which the authorities have worked since the fire. In 24 hours they have done so much to plan, fund raise, and actually get things done. I’m not sure that the 5 year target will be achieved but it puts the UK to shame for their inactivity, and prevarication over so many things. Public enquiries 30, 40, 50 years after the event, prosecuting old soldiers 45 years after the events, coroners enquiries taking years and years, not to mention – No I will not mention IT. We are not that much faster over here in Canada! Will be most interesting to see how fast it does go up. It is a very sad event for the entire world. Many important historical relics were destroyed and lost forever. As you mentioned in your post of missing impending doom events, I will share a couple. In the Later 60’s, I don’t remember the date, I was coming home for Christmas and scheduled to fly from Dulles Airport to Kansas City. I was bumped at the very last moment as I was flying Military Standby. The very pregnant lady the bumped me boarded instead. The planed crashed with no survivors. I was in process of boarding and so I was listed as one of the passengers. Sad. Additionally, our Daughter-In-Law worked in the Twin Towers above the first plane crash on 911. She felt ill that morning and so she and our Son waited a half hour before deciding she felt better. She was crossing the lobby at about the 39th floor to get on the elevator to take her all the way up. That’s when the first plane hit. She barely made it out. You never know. Was definitely not your time, Jan! There are so many moments where we are faced with that fact. Glad your number hasn’t been called yet. Dale let’s look at it this way. The true Miricale is no one was killed… Sadly a Firman was injured but no one died. The building still stands as do some of the beautiful stain glass windows. We have had these nightmares in England too, Windsor Castle, York Minster and honest they are as good as if not better than new honest. The French reckon it will take them 5yrs to rebuild and honest it will be glorious …the history and feel of the place will still be there. This is stone and mortar all will be well. Sending you big hugs. BTW Hun keep dodging the Reaper I shall be doing the same .. Absolutely. That is the true miracle. As for the rebuilding, that is already causing quite the uproar, isn’t it? All that money being found for a thing (no matter how glorious) but where is that same generosity when it comes to people? An argument for another day. willowdot; isn’t it amazing, 700millions have already been pledged by French ‘businesses’ in less than one day, and I’m sure the one billion they’ll need will be together before Good Friday – and YES, I really, really would like to see that something like that happens for PEOPLE not only for THINGS! The notre dame cathedral brought me in tears and its so sad. Those shoulda, woulda, coulda really make you stop and think. While I know you’d have loved see the crown jewel of Paris, selfishly I’m so grateful you didn’t. I will mourn the no doubt lengthy though temporary loss of this remarkable site and hope with the time I have left, I can see something equally comparable. Whether here or elsewhere, the gypsy gene is stirring again and it will need to be satisfied. Why are you grateful I didn’t? Or is it you’re grateful I didn’t see it’s demise? And I agree with you, there is much to see in the world. I am itching to go out there and see it! I’m glad you didn’t see the demise. To see it could have been heartbreaking, something I fear gypsies like us would be touched in a negative and profound sense. This is true. We gypsies would be. Dale, I’m sorry timing was against your seeing Notre Dame and spending time in Paris. I was in Paris and visited the cathedral a dozen years ago. It was an awing experience. I learned of the fire and saw pictures of Notre Dame burning while googling something on my computer. I felt incredibly sad about the monumental loss to the world. And then I thought of the wonderful high I experienced when Tiger Woods won the Masters. Ces’t la vie. Very glad you did get a chance, though. No worries. I was supposed to go to Burgundy for a week then was going to visit for two weeks and I’m not even sure where I would have ended up. Happy Easter to you, Kiki! I feel much the same about the loss. I have spent so much time studying it that it feels like an old and treasured friend, though I’ve never seen it in person. It’s sad when something so iconic is damaged. I saw it from the outside years ago but didn’t go in and even so I feel sad that I’ll never see it the way it was. I think I am a believer in fate – or at least that we all end up where we’re supposed to be at a moment in time, however we get there…. I could not agree with you more, Andrea. In the grand scheme of things, it is a beautiful thing and a sad thing that it’s beauty has been destroyed, though will rise again. But perspective is needed here as well. No one died. Hi Dale! It was very saddening to see this, but your point is spot on that nothing lasts forever or is indestructible. Seeing all those relics and burning was unreal. But I love that the firefighters did the most remarkable job of saving what they could of it. I was fortunate to have seen it in 2017 on the Fourth of July. Though I didn’t go inside(because the line was 2-3 hour wait that I didn’t have time for), I did take photos of it and around the area. That in itself is a site to behold, and that was one of the best days of my life. I’m not sure they’ll make the 5-year target either. However, in five years, Paris is the site for the Summer Olympics in 2024, which makes me think this is a reason for the supposed and targeted 5-year deadline. With that said, the priorities are shown with this, too. And, not in a good way. But this is a reminder to all to see what you can in this world while you can. You just never know. Thank you for reading and taking the time to leave a great comment. I imagine I would not necessarily have waited 2-3 hours either to go inside. Priorities are strange indeed when one stops to think. And yes. I’ve had stronger reminders than buildings burning to go out and see the world. I watched the trailer. The show looks fab, but I never even heard about it. There’s way too, much to watch on TV, cable and streaming. How could anyone know about all the shows? Oh and I know what you mean about too much on TV. This was years ago… lucky you! !